Hayes set the tone for huge victory. Former Livingstone Blue Bear Quanera Hayes helped lead Team USA to a gold medal in the women’s 4×400 meter relay at the IAAF World Championships in London on Sunday. 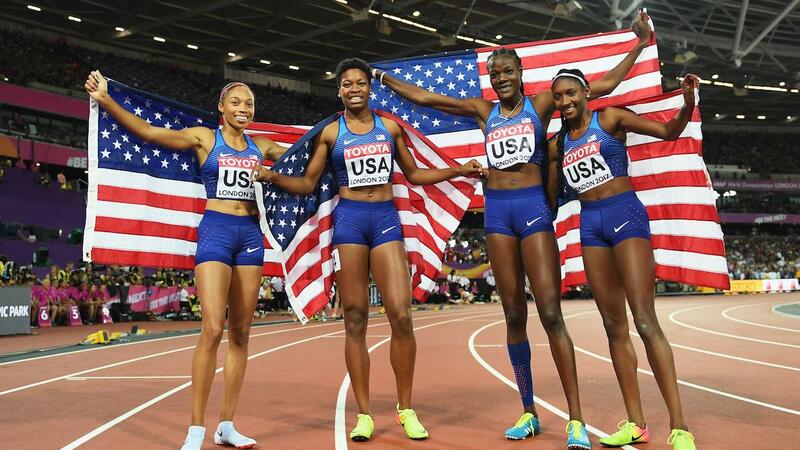 Quanera Hayes, Allyson Felix, Shakima Wimbley and Phyllis Francis won by the largest margin of victory in world championships history – male or female – to capture the first Team USA gold medal in the event since 2011. The United States won silver medals in 2013 and 2015. Hayes ran the first leg for Team USA. The ladies finished with a time of 3 minutes, 19.02 seconds, followed by Great Britain in 3:25.00 and Poland in 3:25.41 Sunday night at London Stadium. That translated to a distance of about 50 meters. The previous greatest margin of victory for the women’s relay was Team USA over Jamaica in 2009 (3.32 seconds) and for the men’s relay was Team USA over Kenya in 1993 (5.53 seconds). Team USA posted the fastest time in the world this year. The previous best was Team USA’s semifinal time of 3:21.66. Hayes was a four-time NCAA Division II champion at Livingstone College and 400-meter medalist at last year’s U.S. and World Indoor Championships. In June she won the 400-meter sprint title at the 2017 U.S.A. track and field outdoor championship. She posted the fastest time in the event in the world at that point at 49.72 seconds. Hayes is from Hope Mills, North Carolina.